I do not know how to pass slalom track on the optimal trajectory. But I feel well the wrong path that is too straight or too round. Therefore by contradiction method it is possible try to find your trajectory. As was mentioned in the introductory note (Slalom, training of adults), slalom track assumes obligatory turns determined by slalom poles. This is obvious difference from the free skiing, where you can adjust the arc depend on relief features, gained speed and snow conditions. But the main thing is not even that. In free skiing is much easier to use your skill for all 100% ie put pressure on skis with full force and to acieve limit in edges angle. Even more. If there is a gap in the skill, it is possible to pass through appropriate part of the arc without notice the gap. In slalom track all exactly the opposite. Gaps in technique grow up capturing a significant portion of the arc, and the pressure and edging angles decrease, while the movements becomes more awkward. Unfortunately this is normal situation when visually like two different skiers are on the track and in free skiing. Even worse. I think, for every level of skill one can install such a track that skier will not recognise himself. In my experience trajectory in slalom track it is highly dependend on the specific skier, not only on the class, but also on habits and physical conditions. Too straight path. When I started to ski on tracks (I was taught by myself), my path was composed of straight line segments. 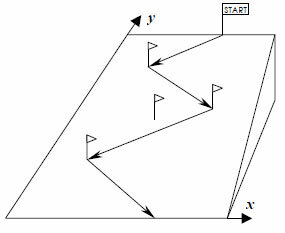 Phase of traverse in the direction of slalom pole, then turn around the pole, then phase of traverse again. In the giant slalom is certainly was not working, as speed not allowed to stay in a sharp turn. Therefore, for the giant there were corrections: the direction of traverse to an external flag of gates, that is approximately 10 meters away from working double-pole. Starting point of turn – when the next flag is beneath you. 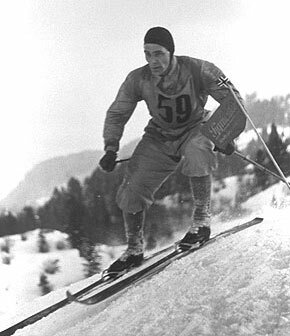 Then the same approach was transferred to closed turns of slalom, but to a lesser extent, aiming of traverse was 1-2 meters away from the flag. Such way I used to ski before epoch of carving skis. In general, the question of trajectory was not very important for me that times (before carving) because inner sense was that main part of path is traverse where much press on (classical) ski could be done without fear that ski suddenly turn inside the gate. Too round path. 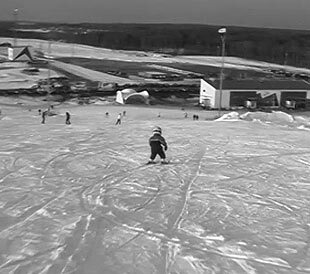 I taught son to ski with only round turns as usual for carve ski (more about it here: first steps how to teach a child to ski), so when he began to ski on slalom track, it was difficult for him to link round turns to slalom poles. Trajectory was usually too far from track. 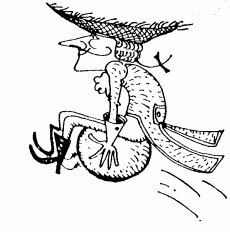 But he can press on ski the entire arc, and rode without slipping. These are two extreme cases of trajectory. My previous habit lead to straight path and that is not correct. But I can and put the task to go completely round turns so that near gates go across the slope. And although it is also wrong, I tried to go so in the season 2016, as in my case, I need to work with the settings of “head” to get rid of straight shoots. In training, when drilling several times the same route we have the opportunity to test the different arcs. Indicator of correct arc is when you can not just ride without slipping, but also squeeze the acceleration from the arc. Of course it depends not only on proper trajectory, but also by complexity of track and level of skill. Here are a couple of indicators by which one can recognize the wrong path. 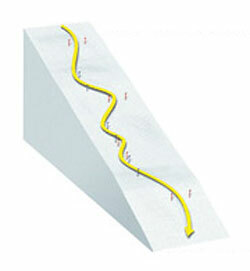 The path is too straight, if the static (“frozen”) posture appears when approach to slalom pole. This means that you can not press more to ski or put edges to more angle, because otherwise “grab” slalom pole. However, this fact of “grab the pole” I do not feel as it is in the subconscious. Instead everything is “good” in the head, as you drive good to the pole and quietly (because everything is already done) waiting for next phase of turn. Static posture is often accompanied by unpleasant scraping and even “walking” of outside ski because of lack the load. This is a good indicator because could be easily seen. At next run need to force myself to ride “away” in the turn from accustomed path and then how would return back. To start ride away to 10 centimeters (on internal feeling), and then to another 10. The main thing that “freeze” must gone completely, that is come to a pole with the natural end of the body downward movement. Two more observations that may be controversial. 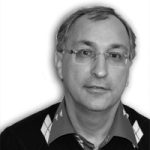 First – this is advice from Alexander Geraskin (he gave it about 10 years ago), in the trajectory is highly desirable to insert a straight section down (when come to pole). I found a picture on the Internet with one of the many interpretations of the phases of turn (translation of words in the picture: traverse | first third of turn | second third of turn | last third of turn | traverse). In the picture I set slalom poles (red circles), while the trajectory corresponds to the trace of skis on snow. In the terminology of this image “the 1-st third of the rotation” refers to the theme of “Catch the arc“, but the “2nd-third” it is just this “straight section by Geraskin”. Second advice I’ve heard from several coaches, but the most clear it was formulated by Boris Proshlyakov. Directly before a pole it must be inserted straight section across the slope while turn must be finished before this (in the picture section from the middle of the “third third of turning” to middle of “traverse”). And on this section you just need to press to ski in the lowest stance and calmly go to pole, then also calmly pass pole, and only after that to prepare for entry into the next turn. Brought here these two things because excessive emphasis on the first of them will lead to a very straight path, and an overemphasis on the second – to very round path. All the arguments above would work fine if skated on the rink. In the real ski track, even in the training for which you go for the 5th time, I can not be sure how to behave skis, legs, body and arms. Even worse. In the free skiing I can see (and as seqience control) the arc, while in track all attention goes to the slalom poles and the trajectory of the body, so the trajectory along which goes skis drops out of sight. It turned out that this can trained. Once a day of free skiing the condition of snow was very different: ice in the occasional trace of like slalom turns and deep powder of ice crumbs between. So I decided to ride along this spontaneous unallocated slalom track and found that the feelings is quite similar to the “real” track, movements began immediately jammed and turns more ragged, but exactly on the path. Included it to complex of exercises in free skiing. You how to draw an arc in front of eyes and go along it. I like the proper feeling of predictability of path and ski behaviour, so pay more attention on it next season. It is necessary not just to follow proper trajectory, but to press also ski to “rail”. That is not enough not to fear push hardly to ski. 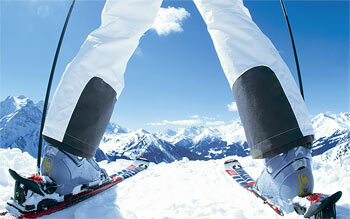 To do this, you need to be sure of the behavior of the skis. I have such confidence sometimes, unfortunately not often. Without this, better not to try force of press because instincts transfer it into slip of tail of ski or to scraping. During this season confidence in ski was increased. As I consider now confidence in ski is better to work out in the free skiing, going down the slope on a variety of twists and accelerations, but with mandatory clean arcs. Sometimes I catch the beautiful feeling when one turn immediately goes to the next one without any pause. This is particularly evident in the figures. 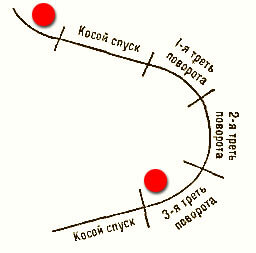 for example, a closed turn, followed by a “hairpin”, which barely have time to fit (so the body is not stand up as usual at the hairpin), and again closed turn. That is, it turns out something like a great “giant” arc with additional change of edges in the middle of arc. So, if this turn passed with just a feeling of “big arch”, then, it seems to me, this is the perfect trajectory with the ideal “rail” passage. Assume that everything above could be done perfectly. But in the track something can go wrong. Because of at least two reasons. First, it is all sorts of irregularities of the slope, grooves, bumps, that can throw a ski a little bit away. Second, sometimes is necessary to drift, ie, early scraping (see terminology here: Bricks from basement of ski technique). This is due to the fact that the curved trajectory for this particular turn may not exist. How to get out of these situations I know yet only in theory. In the path it present a special place for proper adjustment of trajectory. Apparently it’s “straight section” at the turn, which said Alexander Geraskin. At the entrance to turn need to put the skis on edge, but not to press immediately. So very gradually increase the pressure and edge angle. This enables good approach to the main pressure near pole. 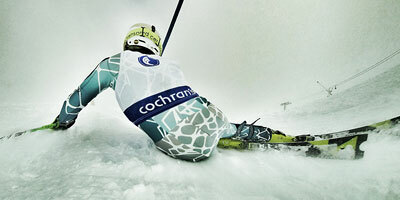 It is possible to adjust the trajectory here, holding or increasing the pressure in the skiing and angle of edging. Unfortunately, nothing to add from my own experience. Hopefully next season will catch it.